Maine Speaker of the House Sara Gideon, D-Freeport, speaks during the first session of the 128th Legislature at the State House in Augusta, Dec. 7, 2016. Gov. 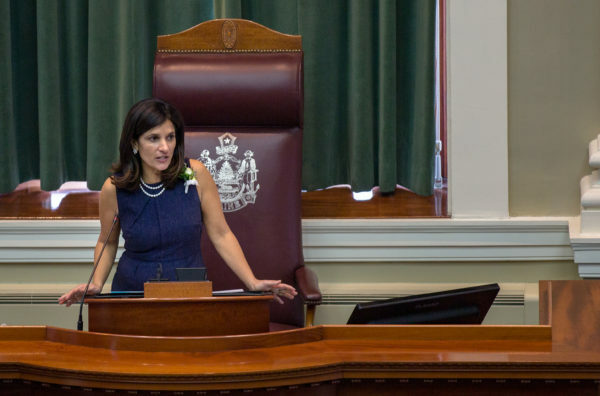 Paul LePage has devoted a lot of bandwidth this week to attacking legislation sponsored by Democratic House Speaker Sara Gideon that proposes to use existing, unspent funds to actually help some of the state’s poorest residents. LePage must feel as though the legislation, which responds to actual challenges faced by Maine’s poorest families, imperils his welfare-slashing legacy. He attacked Gideon’s wide-ranging legislation during a talk radio appearance Tuesday and in his weekly radio address issued later the same day. Gideon’s legislation, LD 1475, would for the first time in 15 years raise the monthly amount of cash assistance available to a family with kids receiving help through the state’s Temporary Assistance for Needy Families program. Poverty takes a major toll on a child’s development, setting that child back in terms of physical and mental health, academic achievement and long-term career prospects — consequences that taxpayers later have to pay for in the form of expensive special education, health care costs and future state assistance. Yet a poor family of three on TANF in Maine receives a maximum of only $485 per month, an amount that doesn’t come close to ensuring a household’s financial stability. Gideon’s bill would deliver a long overdue increase, raising Maine’s maximum benefit to the average given out in the rest of New England, or $637 per month. Data from the U.S. Census’ American Community Survey, compiled by the Maine Center for Economic Policy, show that the proportion of Maine children growing up in extreme poverty — in households with income less than half the federal poverty level, about $10,000 annually for a family of three — has been on the rise in recent years while it’s generally held steady nationally. But LePage’s changes to state assistance programs since he took office in 2011 have done nothing to address this sad reality. His policies have resulted in 14,550 fewer children receiving help from TANF and in parents facing additional hurdles when attempting to gain access to assistance or to keep it. Gideon’s legislation also responds to other well documented needs faced by the state’s poorest families. Low-income parents in Maine struggle to pay for child care, and the state-funded child care assistance that should be available to them is falling short. The number of Maine child care providers accepting state-funded vouchers has fallen by 60 percent in the last decade, and the number of children enrolled in child care with the help of a voucher has declined by half in that time. Gideon’s bill would raise the rate that child care providers receive for enrolling state-subsidized children, as many providers say they simply can’t afford to accept below-market rates for subsidized kids. But the LePage administration has produced nothing in the way of trustworthy data that show ending people’s assistance actually helps them escape poverty. Gideon’s bill, on the other hand, would require that the state Department of Health and Human Services start collecting data on how former TANF recipients fare once they’re no longer receiving assistance and use those data to evaluate how well TANF is serving the state’s poorest residents. LePage claimed this week that the funds Gideon would tap to pay for her bill — a well-documented pool of unspent federal TANF money that reached $155.5 million last June — either don’t exist or have been fully committed. But there’s little evidence the LePage administration’s plans for spending this money in the coming years are the result of a well-designed strategy to help Maine’s poorest escape poverty. Hundreds of pages of internal DHHS emails released to the BDN earlier this year showed department personnel in 2015 casting about for programs funded by state tax dollars that the agency could instead fund with TANF money. Through this process, DHHS spent more than $13 million in TANF funds unlawfully and reversed that spending following the BDN’s reporting. The department emails showed that the top priority was, simply, to save state taxpayer dollars by using TANF to pay for as much as possible. If lawmakers pass Gideon’s bill this spring, it will mark a welcome departure from the welfare recipient shaming that has characterized the LePage era. Maine’s poorest children deserve policies that actually aim to help them, not policies that penalize their parents for being poor.